"Remembering that the book 'How to Tell a Story' was too small, I sent Bliss a list of recent magazine articles with the idea that they should be added to that book to make it large enough." In April 1897 Harper and Brothers published a collection of eight Mark Twain essays in a small volume titled How to Tell a Story. Seven of the eight had been previously published in various magazines. The title piece "How to Tell a Story" first appeared in the October 3, 1895 issue of Youth's Companion. Other essays in the collection were originally published in The North American Review including "Private History of the 'Jumping Frog' Story" (April 1894); "In Defence of Harriet Shelley" (July through September 1894); "What Paul Bourget Thinks of Us" (January 1895); and "Fenimore Cooper's Literary Offences" (July 1895). 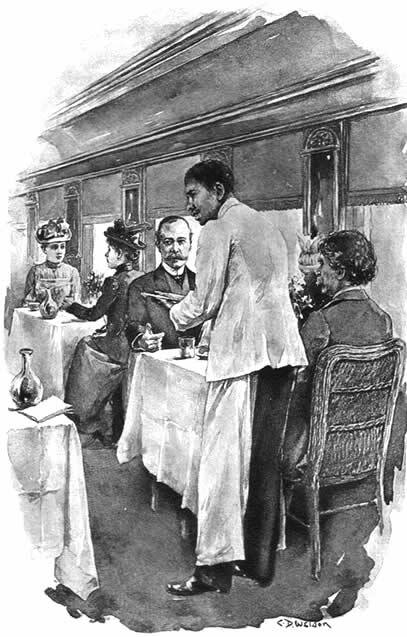 "Travelling with a Reformer" from Cosmopolitan, December 1893 is included in the collection although the original illustrations by Daniel Carter Beard for the story were dropped. Also included is "Mental Telegraphy Again" from September 1895 Harper's Monthly. The only previously unpublished essay in this first edition is "A Little Note to M. Paul Bourget" which was Clemens's response to criticism he had received after publishing his first Paul Bourget article in 1895. In April 1900 at the same time Frank Bliss was compiling Volume 22 of the uniform edition of American Publishing Company, Harper was also in the process of adding another collection of short stories to their uniform trade editions that were bound in red cloth with gold cornstalks. Their latest edition was titled The Man That Corrupted Hadleyburg and Other Stories and Essays which was published June 11, 1900. Frank Bliss used Harper's How to Tell a Story and Other Essays as the foundation for Volume 22 of American Publishing Company's uniform edition of Mark Twain's works. Volume 22 was copyrighted on April 9, 1900. 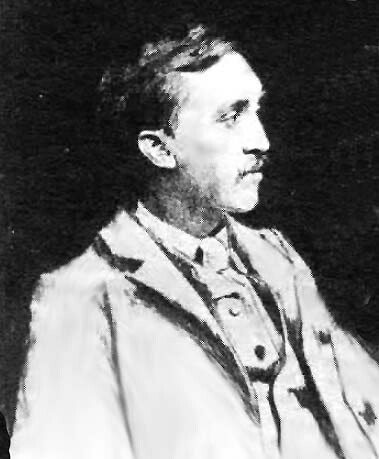 To bulk up the original slim collection of eight essays, Bliss added eight additional essays, some of them had also been selected for inclusion in Harper's 1900 edition of The Man That Corrupted Hadleyburg and Other Stories and Essays. Bliss included "The Invalid's Story" which was actually part of a longer essay titled "Some Rambling Notes of an Idle Excursion." "The Invalid's Story" had been deleted from the longer story when it was first serialized in Atlantic Monthly in 1877-78. However, Clemens liked "The Invalid's Story" and had restored it when "Some Rambling Notes of an Idle Excursion" appeared in the collection The Stolen White Elephant, Etc. published by James R. Osgood in 1882. Harper and Brothers, however, had again deleted "The Invalid's Story" from the longer essay when they included "Some Rambling Notes of an Idle Excursion" in the 1896 edition of Tom Sawyer Abroad / Tom Sawyer Detective and Other Stories. Bliss followed Harper's lead when he compiled Volume 20 of the 1899 uniform edition, Tom Sawyer Abroad / Tom Sawyer Detective and Other Stories, Etc., Etc. With Volume 22 Bliss had the opportunity to use "The Invalid's Story" as a standalone essay. Bliss was likely confused about what essays had been included in the previous volumes. "The Captain's Story" which is another portion of "Some Rambling Notes of an Idle Excursion" is also included as a standalone essay in Volume 22. However, this essay is intact in Volume 20, Tom Sawyer Abroad / Tom Sawyer Detective and Other Stories, Etc., Etc. Part of Bliss's confusion may have resulted from the fact that in 1892 Clemens's own Webster and Company had published both "The Invalid's Story" and "The Captain's Story" (from the longer "Some Rambling Notes of an Idle Excursion" ) as two standalone essays in the slim volume titled Merry Tales. Thus, in spite of his best efforts to avoid duplication of material, "The Captain's Story" is a duplicate essay and the text of it appears in two separate volumes of the 1899 uniform edition from American Publishing Company, in Volumes 20 and 22. The 1900 edition of Volume 22 also features "In Memoriam," Clemens's tribute to his dead daughter Susy which was first published in November 1897 Harper's Monthly. Appearing in a collection for the first time are "Stirring Time in Austria" from the March 1898 issue of Harper's Monthly; "Concerning the Jews" from the September 1899 issue of Harper's Monthly; "From the 'London Times' of 1904" from November 1898 Century magazine; and "At the Appetite-Cure" from August 1898 Cosmopolitan. 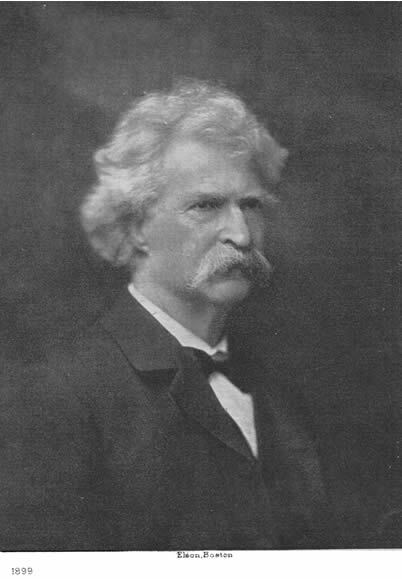 The final essay in Volume 22 is Samuel Moffett's biographical essay about his uncle, reworked from Clemens's own draft, titled "Mark Twain: A Biographical Sketch." 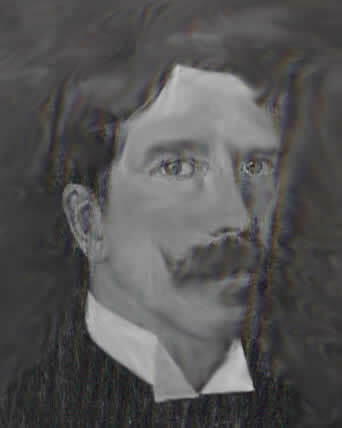 Moffett's essay first appeared in the October 1899 issue of McClure's Magazine and was accompanied by a footnote containing a puff for American Publishing Company's uniform edition of Mark Twain's works. Although Clemens had an opportunity to revise and refine his work for the uniform edition, there is little evidence to suggest he took an active interest in doing so. Production of the new printing plates also had the potential to introduce inconsistencies into the texts that were the result of typesetting errors. However, no extensive comparison between Volume 22 and the previous printings of each essay has been conducted. Instead of using the book's title How to Tell a Story and Other Essays on the spine of Volume 22, Bliss chose to identify the book as Volume XXII / Literary Essays, Etc. This designation appears on all the uniform editions published by American Publishing Company including Autograph Edition, Edition De Luxe, Japan Edition, Author's De Luxe Edition, Royal Edition, Underwood Edition, Riverdale Edition and Hillcrest Editions. Frontispiece for Volume 22 Volume 22 is the first volume in American Publishing Company's uniform editions that does not feature an engraved frontispiece portrait of Clemens credited to W. H. W. Bicknell. 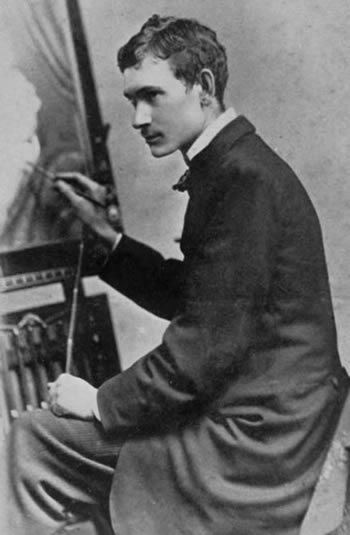 The frontispiece portrait for Volume 22 is based on a photograph of Clemens taken in 1899 by H. W. Barnett in London. It was etched by the Alfred Walter Elson Company of Boston. Charles Dater Weldon Charles Dater Weldon (b. 1844 - d. 1935) was born in Mansfield, Ohio. He is listed in both the 1850 and 1860 U. S. censuses as the son of James Weldon, a successful merchant and his wife Isabell. Weldon's early education was at the Cleveland Institute, a military academy. At age eighteen he moved to Philadelphia and worked for a financial firm. He then spent a year at Iowa City managing a hat and fur store. His first work in the art profession as a lithographer was in Chicago. He later went to New York and worked as an illustrator for the New York Daily Graphic. For a short while he studied abroad at Leigh's Academy in London before returning to his job at the Daily Graphic. On a second sojourn abroad to Paris in 1880 he studied under Mihály Munkácsy where he spent two years. Weldon was commissioned by Harper and Brothers to go to Japan in the early 1890s and he spent five years there. He also spent time in China and India and became known as a specialist in oriental motifs. Weldon was a member of the National Academy of Design, the American Watercolor Society and the Century Club. Weldon provided two illustrations for Volume 22 -- one for "Travelling with a Reformer" and a second for "The Invalid's Story." Weldon's illustration for "Travelling with a Reformer" features the same scene that Daniel Carter Beard drew for the story when it first appeared in Cosmopolitan magazine in December 1893. Peter S. Newell (b. 1862 - d. 1924) was born in McDonough County, Illinois, the son of Fred Newell, a wagonmaker. As a youngster, he attended schools in Bushnell, Illinois. He later went to New York and attended the Art Students League for a short time, but he was largely a self-taught artist. He did most of his professional work for Harper and Brothers. He had worked for Frank Bliss previously when he provided five pictures for the first American edition of Following the Equator (1897). 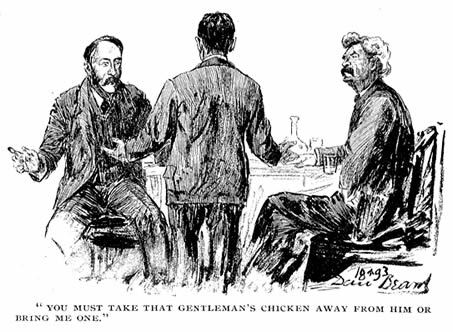 Bliss also hired Newell to furnish six new full-page illustrations for the 1899 uniform edition of The Innocents Abroad. 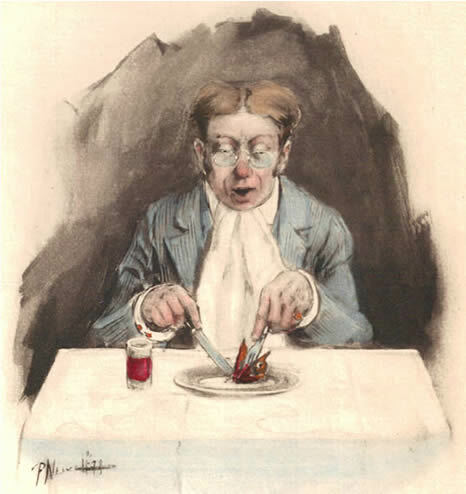 For Volume 22, Frank Bliss chose to reuse one of Newell's original illustrations for "At the Appetite Cure" that was used when the story was published in Cosmopolitan magazine in August 1898. "He Eats a Butterfly" was hand-colored and used as a frontispiece for Volume 22 of the 1901 Riverdale Edition. The following are the original full-page illustrations that first appeared in the 1900 Autograph Edition, Edition De Luxe, Japan Edition, Author's De Luxe Edition, and the Royal Edition issued by American Publishing Company. As other editions were developed and prices were lowered, some of these illustrations were eliminated. 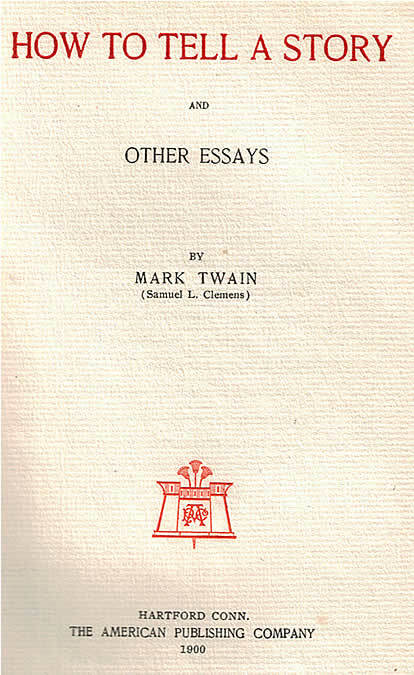 From 1899 until mid-1917 the contents of Volume 22 of the uniform edition of Mark Twain's works, How to Tell a Story and Other Essays, remained the same. In mid-1917, long after Harper and Brothers had taken over production of the uniform editions begun by American Publishing Company, they revised the contents for Volume 22 for a new printing of the Author's National Edition. Harper removed a number of selections including "How to Tell a Story" and retitled the volume Literary Essays which matched the title on the spine. Essays that had originally appeared in Volume 21 were moved to Volume 22. This reshuffling of material is one source of confusion for book collectors who often try to acquire replacement volumes for incomplete sets. The task is further complicated due to the fact that the bindings for a number of years were extremely similar even though the contents were different. Harper edition of Vol. 22, How to Tell a Story with spine title Literary Essays and printing date of M-Q (December 1916) retains the original 1900 table of contents. Harper edition of Vol. 22, retitled Literary Essays on both title page and spine with printing date of I-T (September 1919) features slightly smaller binding and Arabic volume numbers 22 on the spine and slightly different contents. For the mid-1917 Author's National Edition, Harper and Brothers removed stories from Volume 21 that had been reprinted from the first edition of The £1,000,000 Bank-Note and Other New Stories and moved them to Volume 22. The previous title story "How to Tell a Story" was deleted and "In Defence of Harriet Shelley" became the lead story. In later uniform editions the volume would be retitled In Defense of Harriet Shelley. The following table details the shifting contents of Volume 22. Titles in bold are those that are unique to the particular volume in comparison to the others..
"C. D. Weldon, Painter, Dead at 80," The New York Times, 10 August 1935, p. 13. Schroeder, Edwin C. Personal correspondence, 31 August 2010. Twain, Mark. How to Tell a Story and Other Essays, Volume 22, Japan Edition. (American Publishing Company, 1900). _____. How to Tell a Story and Other Essays. (Oxford University Press, 1996).